Effigy of the KVS Commissioner burnt in Delhi. An old man in crutches has come all the way to Delhi from Bhopal – bearing the brunt of a long journey and the heat, to join the Kendriya Vidyalaya (KV) pensioners holding a five-day sit-in protest to press for their demands. He has served for 30 long years as a teacher in the KV. Renuka, another protester from Amritsar has worked as a teacher for 31 years. Hundreds of such elderly people – pensioners of KV, united under the banner of All India Kendriya Vidyalaya Sangathan Retired Teachers’ Employees Welfare Society (AIKVSRTEWS) – demonstrated a sit-in in front of the KVS headquarters in Delhi on Monday. These protests – in an attempt to put forth a charter of demands – took place simultaneously at regional offices in Hyderabad, Bengaluru and Ernakulum as well. Protesters in Delhi burnt the effigy of KVS Commissioner. Their demands included implementation of 7th Pay Commission Report to the KV pensioners, enhancement of fixed medical allowance of Rs. 1,000 as per the 7th CPC and introduction of Modified Assured Career Progression with effect from January 2006 for KV – in tandem with the various court verdicts. “The KVS pensioners, who had retired after July 2017, are entitled to get pensions as per 7th CPC. However, they got Pension Payment Order as per 6th CPC,” said Dubey. The KVS pensioners have been agitating since March 2017. 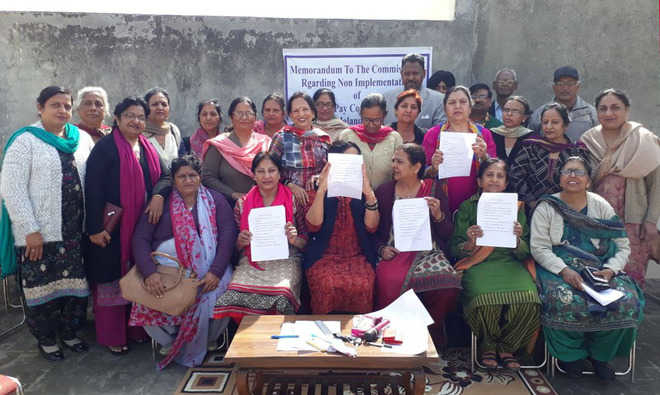 Recently, thousands of teachers from various corners of the country had sent an appeal to the Chief Justice of India to consider it as a writ petition. The Dharna will go on until April 20. “We are here to protest against the apathetic and discriminatory attitude of Ministry of Human Resource Development and KVS, and we will continue our protest till our demands are met,” said one of the protesters.